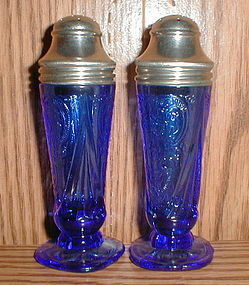 Hazel Atlas, Royal Lace, cobalt, Salt & Pepper Shakers in excellent/mint condition, including the lids. 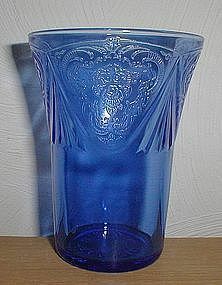 No damage to the glass and the original lids are the nicest I've ever seen. Great condition, even shiny on the inside. 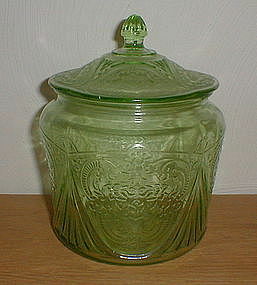 Lids are also the correct originals with slightly different size holes for salt and pepper. 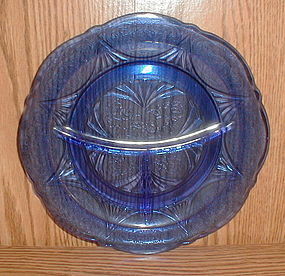 Hazel Atlas, cobalt, Grill Plates, all in excellent/mint condition with no damage or use marks. No nicks on the dividers. Six are available. 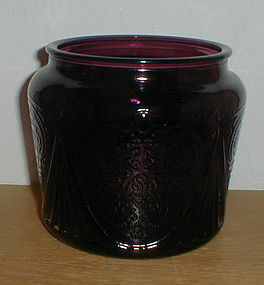 $35.00 for one or $30.00 each on orders of two or more. 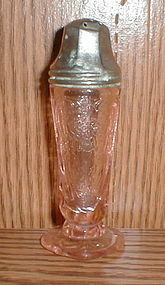 Hazel Atlas, Royal Lace, straight edge Candlestick (only one) in excellent condition with no damage. 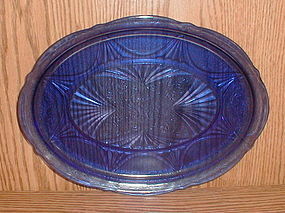 Hazel Atlas, Royal Lace, cobalt 13" Oval Platter in excellent condition with no damage or use marks. 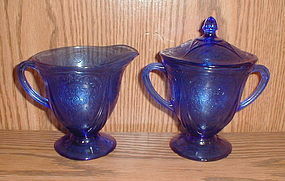 Hazel Atlas cobalt "Royal Lace" Creamer, Sugar & Lid. 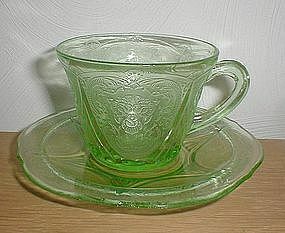 All 3 pieces in excellent condition with no damage or use marks. 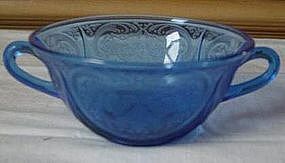 Cobalt, Royal Lace, footed Sherbets in excellent condition with no damage, No chips or inner rime roughness. 6 are available. 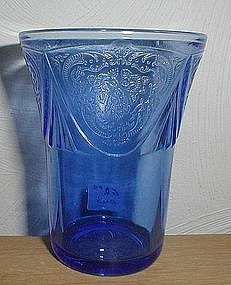 $40.00 for one or $75.00 for two. 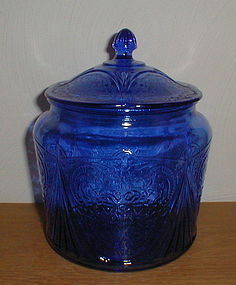 Royal Lace cobalt Cookie Jar in excellent condition. 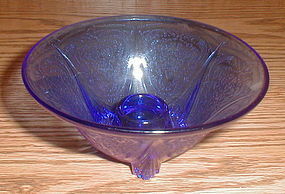 No damage to the lid or the base. Not even any flea bites on the edges. This is an authentic item and NOT one of the new repros. 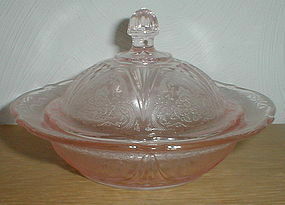 Pink Royal Lace Butter Dish, both top & bottom in excellent/mint condition with no damage or signs of use. 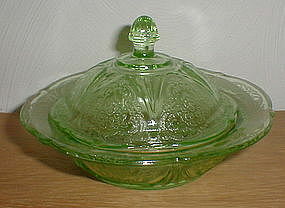 Green Royal Lace Cookie Jar & Lid in excellent condition. Lid is mint, base also, except for a tiny bit of roughness at one spot on the inner edge. 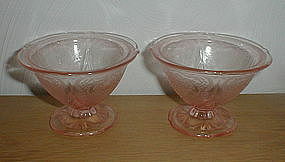 Two pink Royal Lace footed Sherbets in excellent/mint condition with no defects, damage or use marks. $20 for one or $35 for both. 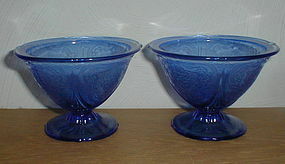 Cobalt Royal Lace Cream Soup Bowls in excellent condition. No damage or use marks. No stacking edge fleas. Eight are available.